Last spring I made a conscious effort to create a list of day trips that I wanted to take in the summer. 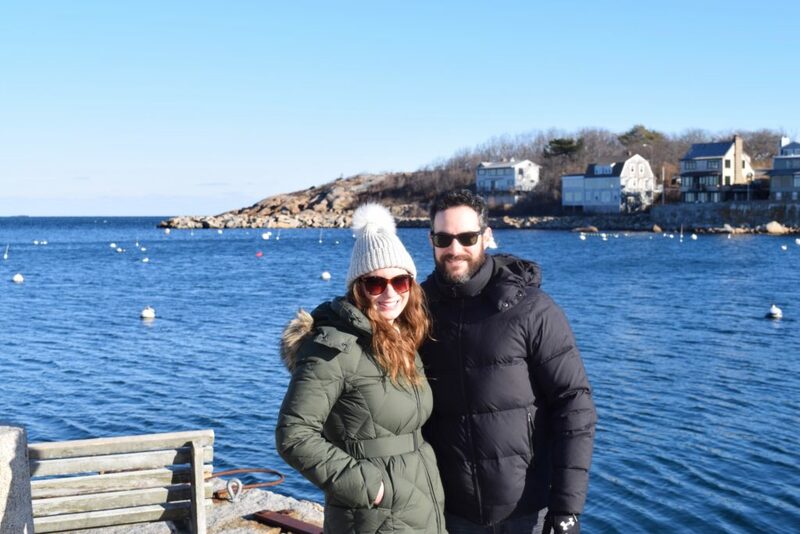 Focusing on beaches and seafood, my fiancé and I hit our fair share of towns along Boston’s North Shore, including Crane Beach in Ipswich and Singing Beach in Manchester-by-the-Sea. 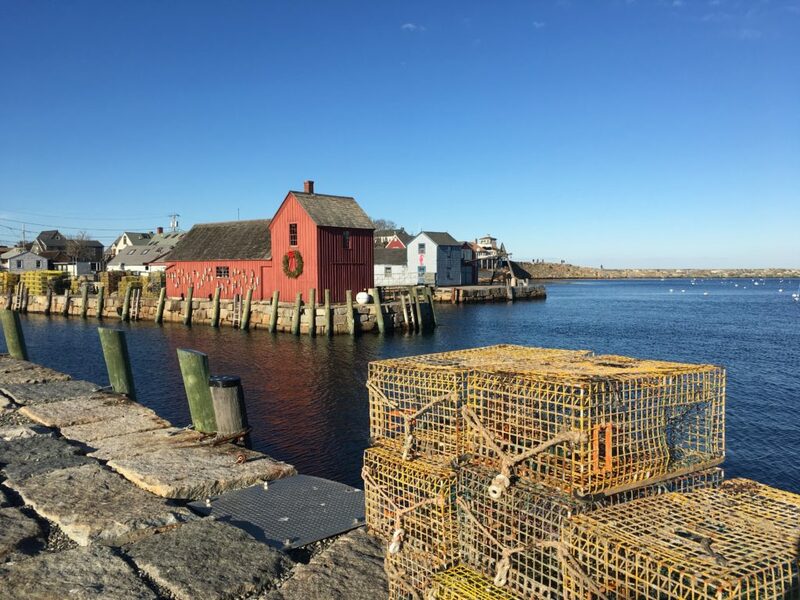 The quaint seaside towns of Rockport and Gloucester were on my list of places to go, but due to time constraints, we never went. So, on a freezing winter Sunday, I did the reasonable thing and suggested that we take an off-season day trip. Knowing that there would be significantly less traffic than in the summer, we hopped in the car and made the drive up to Rockport in record time. In just less than an hour we found ourselves at the tip of the Cape Ann peninsula in the heart of Rockport. 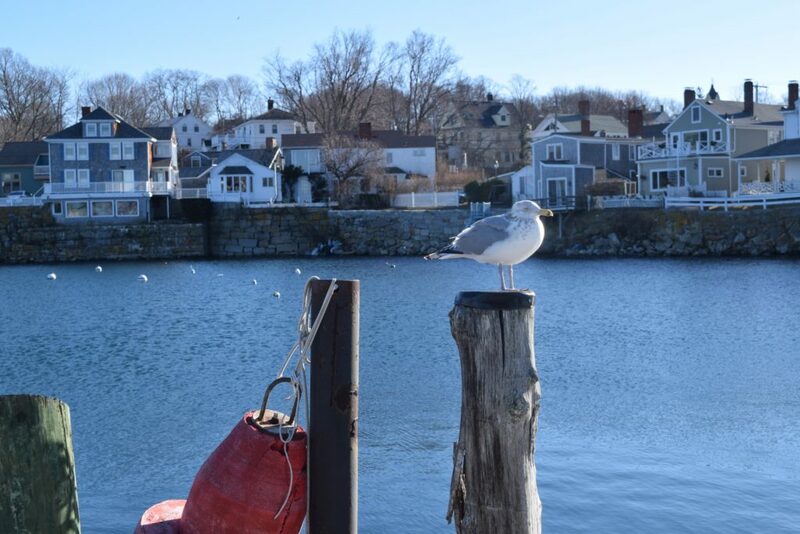 Since it’s right on the Atlantic Ocean, Rockport is more of a warm weather town. 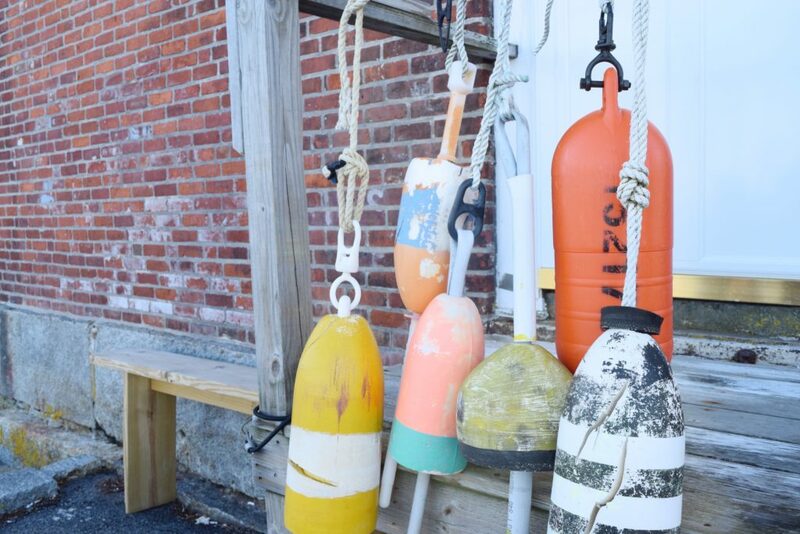 Summers are bustling with locals and tourists alike, seeking a quintessential New England experience. 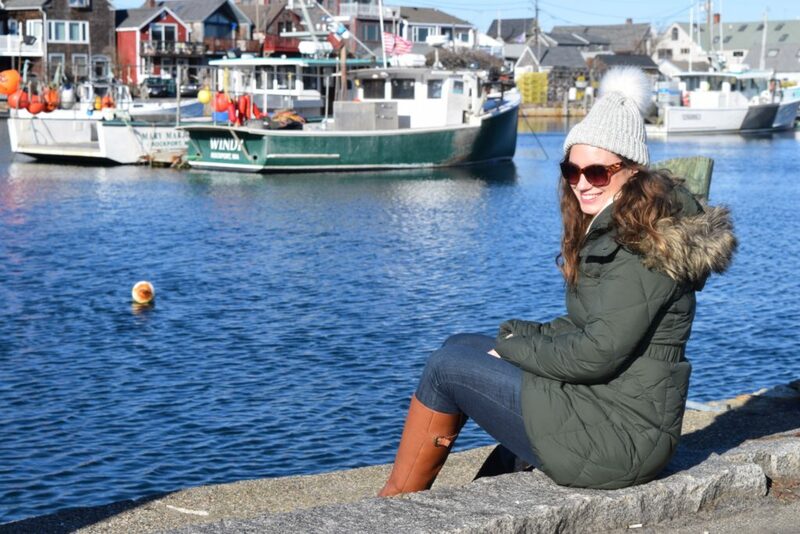 Rockport is 100% New England—from the fishing boats in the harbor and the rocky shoreline, to the stretch of stores in converted lobster shacks on Bearskin Neck. That being said, the winter in Rockport is a much different story. Much of the seaside town was closed for the off-season, but we were happy to walk around and enjoy the gorgeous views. The day was gorgeous—one of those blindingly sunny days with a cerulean blue sky. As any New Englander knows, it’s also the type of weather that makes cold days feel even colder. 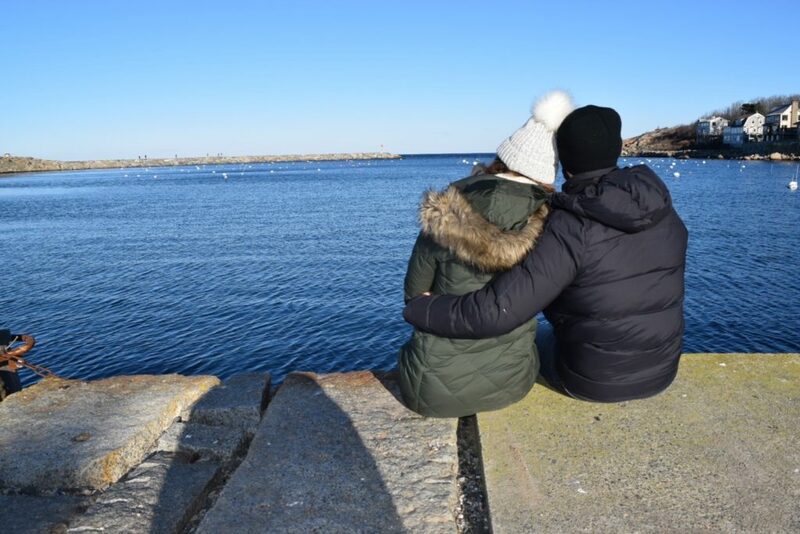 The 30 degree day felt more like 13 thanks to the wind, so we knew our trip to Rockport would not be an all day affair. 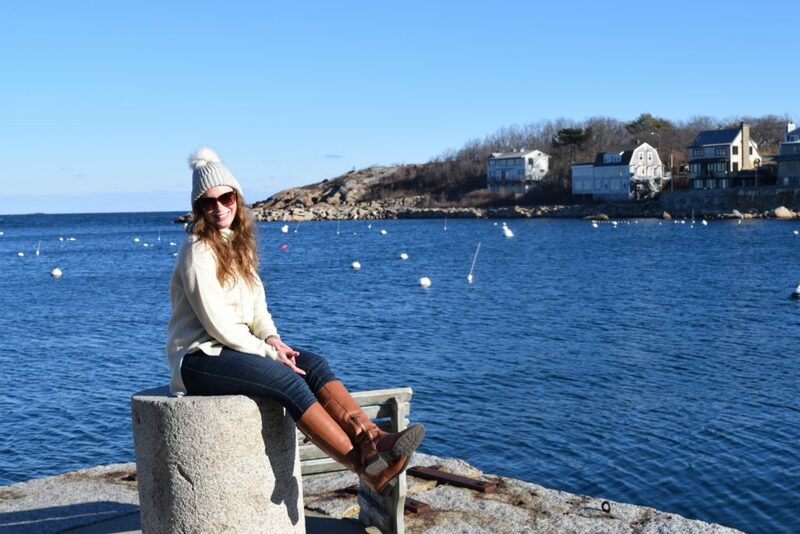 We walked around town and Bearskin Neck taking in the seaside sights. 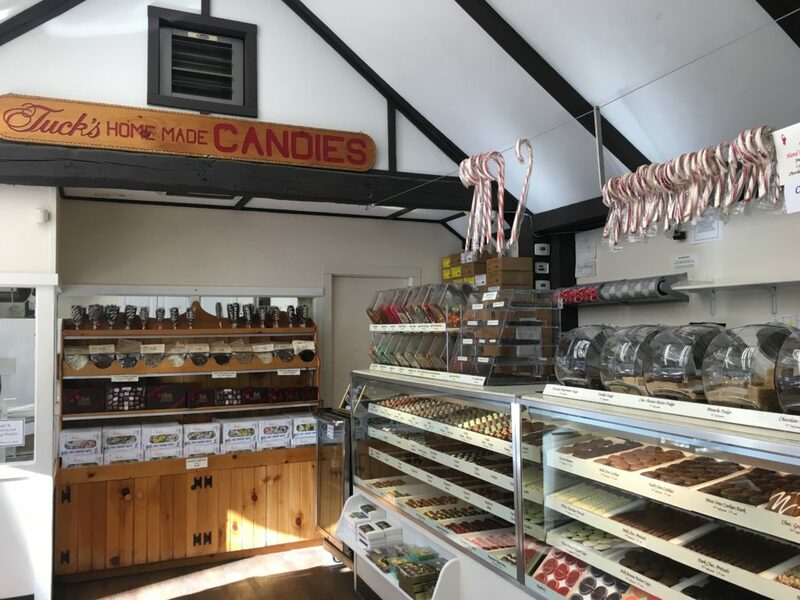 We managed to find a few open stores to browse through, including Tuck’s Candy, where I picked up some penny candy and saltwater taffy. Unfortunately due to the season, pickings for food were slim. Craving seafood and chowder, we drove to nearby Gloucester, less than 5 miles south of Rockport. I had heard good things about Latitude 43 in Gloucester so we made a quick OpenTable reservation (I’m a sucker for any app with loyalty points) and within minutes we were snuggled in a warm table overlooking the harbor. Oyster addicts, we started with a dozen from Duxbury, Massachusetts. 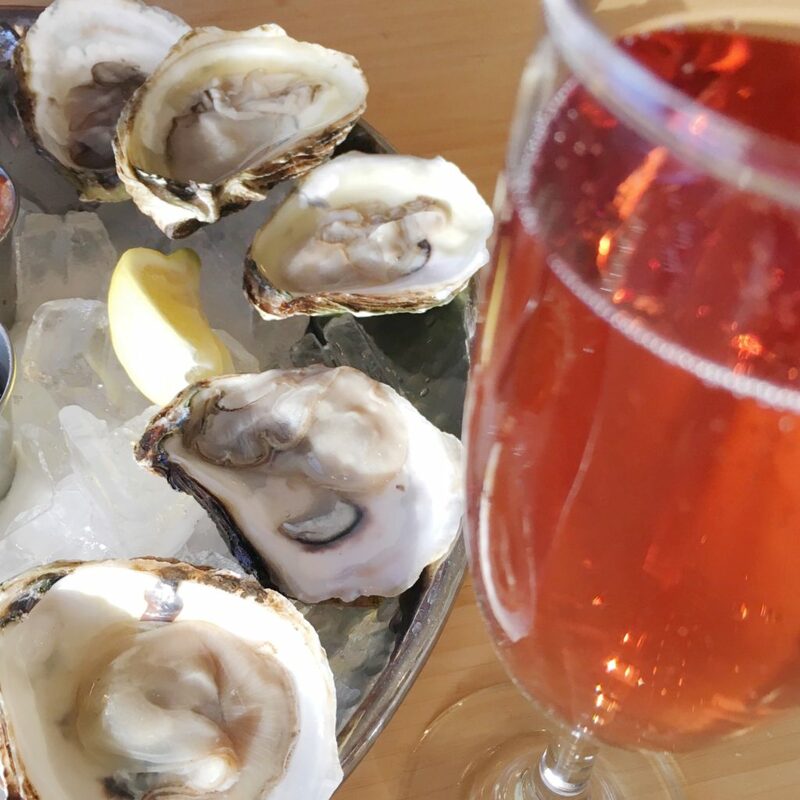 While some oysters leave you hungry, Duxbury oysters do not. They’re are large, meaty, and deliciously briny and paired well with a glass of Rosé. We followed the oysters with a cup of New England Clam Chowder, fitting for a cold winter day, and split the local fish and chips. The haddock in the fish and chips is locally caught fried to perfection. Fresh and oh so delicate, I threw table manners to the blustering wind and ate the dish with my hands! Call me uncouth, but I believe there’s no better compliment to a chef than having someone devour a meal like an animal—thankfully I don’t think anyone saw me do it! Following an amazing meal at Latitude 43, we popped over to Cape Ann Brewing Company next door. The Gloucester-based brewery, known for its signature Fisherman’s Brew amber lager, has a restaurant and tap room at the brewery. 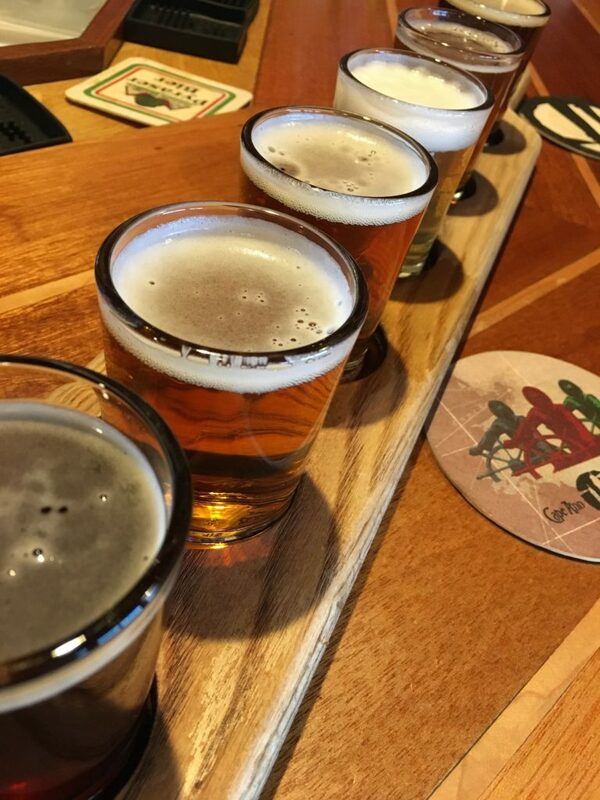 The beers were delicious—we split a flight of six and relaxed in front of the floor-to-ceiling windows overlooking the harbor. Warmed up with food and drink, we eventually hit the road back to Boston, promising ourselves to go back to visit Rockport and Gloucester in the summer. Have you been to either of these towns? What are your favorite things to do there? Fall is the time of many great things in New England—from apple picking and haunted hayrides to leaf peeping and drinking at beer fests, there’s always something fun to do. 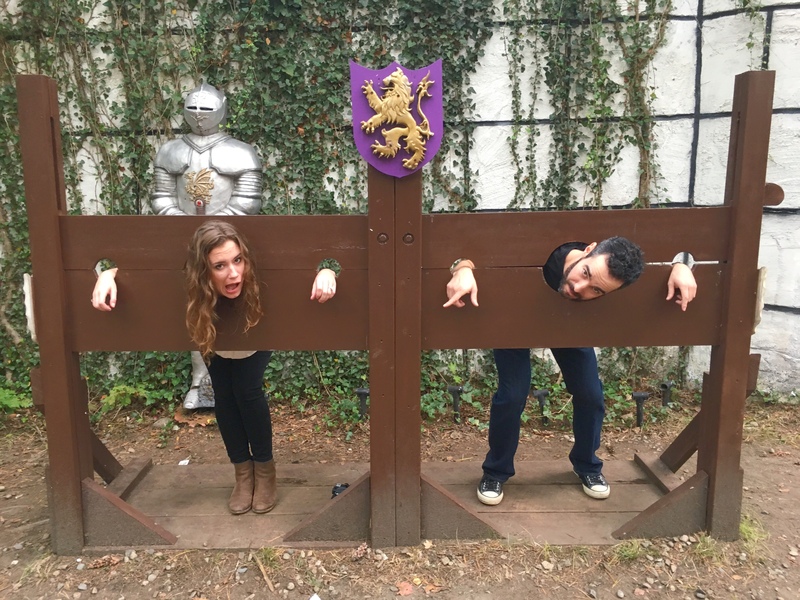 This weekend my fiancé and I took part in another New England fall tradition—King Richard’s Faire. 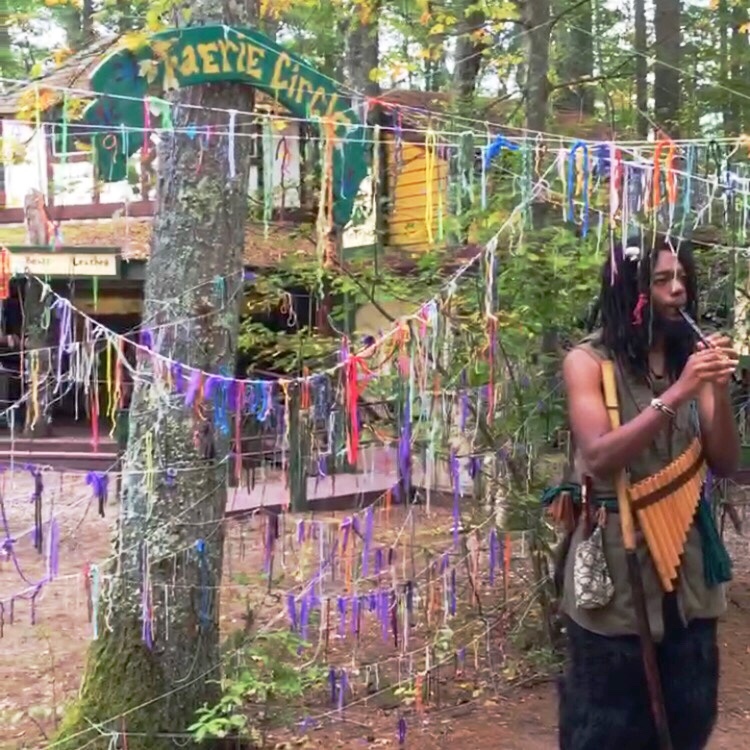 For those unfamiliar, King Richard’s Faire is an annual Renaissance Faire held in Carver, Massachusetts. This year marked the 35th anniversary of the event that draws crowds from Boston and the surrounding areas. 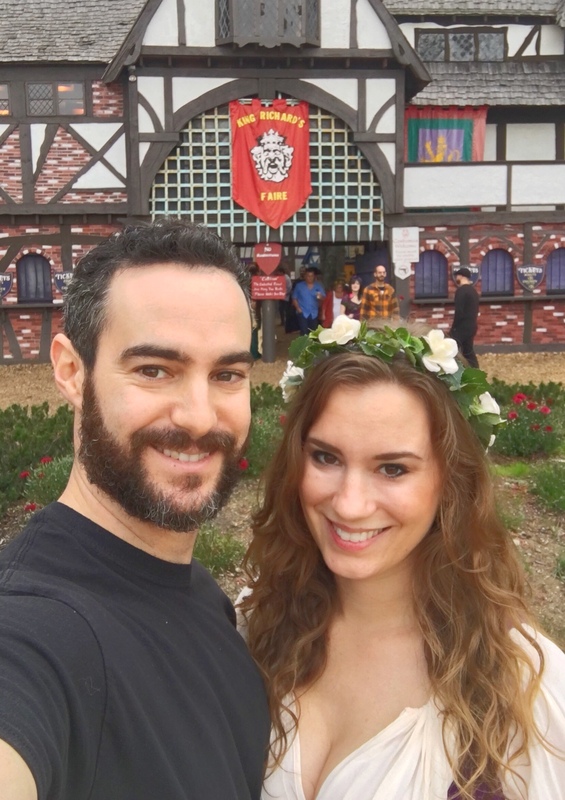 My fiancé and I attended the Faire last year and had a great time, so when the good ol’ King Richard himself offered us two tickets to attend this year, we jumped at the chance! A big misconception about Renaissance Faires is that you have to dress up. While dressing up is fun and plenty of people do so, it’s certainly not required. That being said, last year I purchased a bodice from one of the vendors and was excited to have an excuse to wear it again. 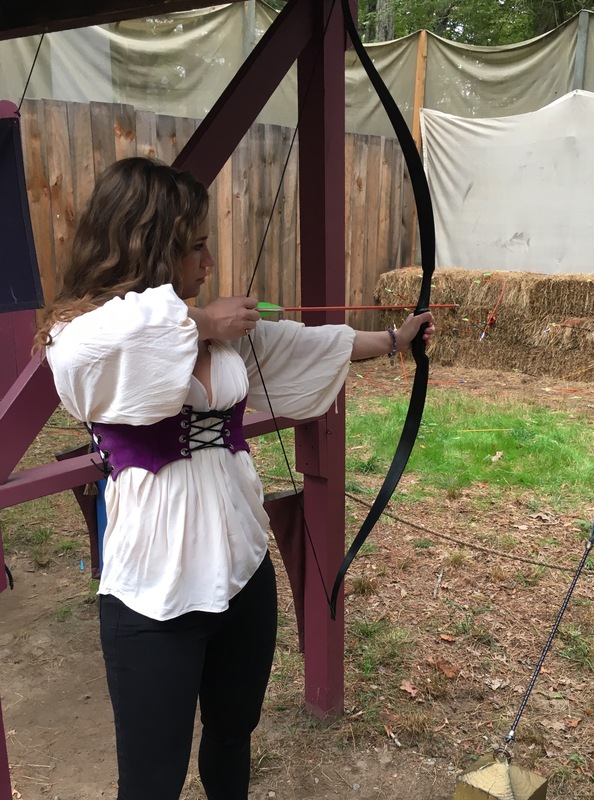 So, on Saturday morning my fiancé helped me tie myself into the surprisingly comfortable chest-emphasizing device and we headed out to the Faire. The ride from Boston to Carver is around an hour, depending on traffic, and an easy ride. Despite the busy day and nice weather, there was ample parking and we found a spot near the entrance. With experience from last year under our belts, we arrived with cash on hand. While there are ATMs and many vendors take cards, food and drink tickets are cash only and service in the area is limited for credit card processing—do yourself a favor and hit up the ATM before you arrive. Food and drink tickets in hand, we ate our way through the Faire—turkey legs, baked potatoes, bacon mac and cheese, friend dough, and all of the beer and mead you could ask for! After stuffing ourselves silly, we made our way to the stocks outside of the medieval torture house, which this big baby opted not to explore! 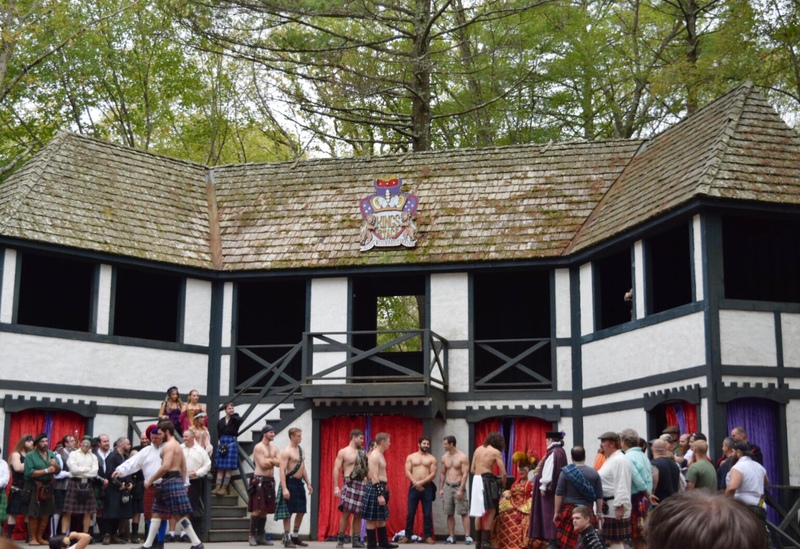 We walked past jousting shows, fire-breathing women, feats of strength, pony rides, a magical unicorn, and a kilt contest full of shirtless men. Everywhere you turn, there’s something to see. Family friendly, there are activities, rides, and games for kids young and old. Last year Ronnie won an axe throwing contest so this year we tested our luck at archery. Despite the mini lesson we got from the attraction guide, neither one of us was a winner. In addition to the attractions and shows, there are dozens of vendors at King Richard’s Faire. Nearly anything you can imagine, and some things you never knew existed, are sold at the Faire. 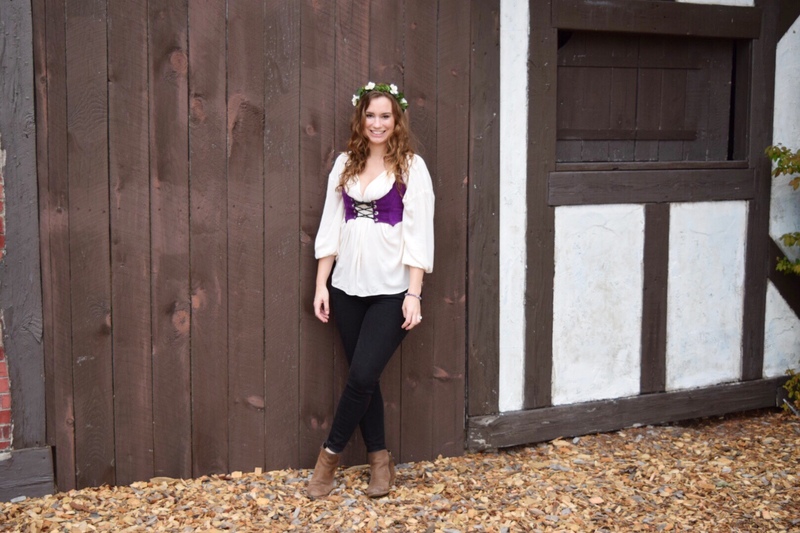 From fairy wings and leather kilts to swords and family crests, you can get your fix of Renaissance Faire wares. We picked up an outfit for my niece and a flower crown for myself but could have easily bought more things that I never knew I always needed! After much frolicking around the beautiful scenery, we headed back home to Boston where I wore my flower crown the rest of the night. 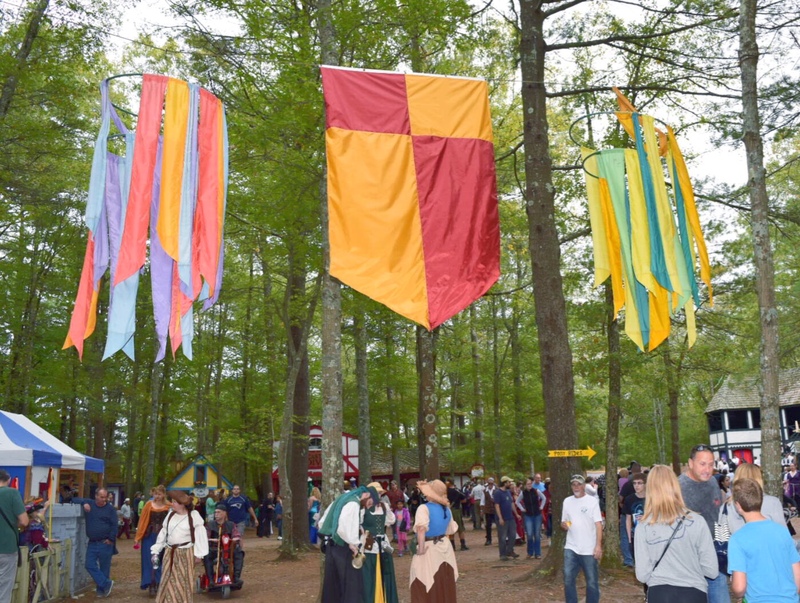 If you’re looking for something fun to do over the next couple of weekends, head to King Richard’s Faire! 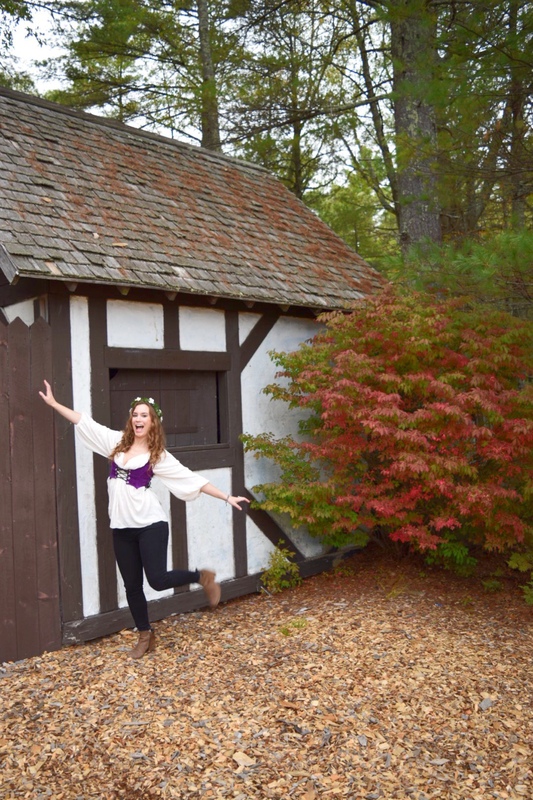 Note: I received two tickets to King Richard’s Faire free of charge, but all opinions and love of fairies are my own.